For the week of May 19, 2014, 81 condos sold for an average price of $3.1 million, while 123 coops sold for an average of $1.3 million. The Walker Tower, One57, and the newly opened Marquand stole the top three spots for most expensive sales that week. NYC’s soon-to-be-tallest residential tower at 432 Park Avenue surpassed its 1,000-ft mark this week and is now taller than any rooftop north of the Empire State Building. The Vinoly-designed building will top out at 1,397 feet – taller even than One World Trade Center. Beauty or beast? We take a closer look at the Herzog & de Meuron-designed 40 Bond — form, function, sales prices and all. 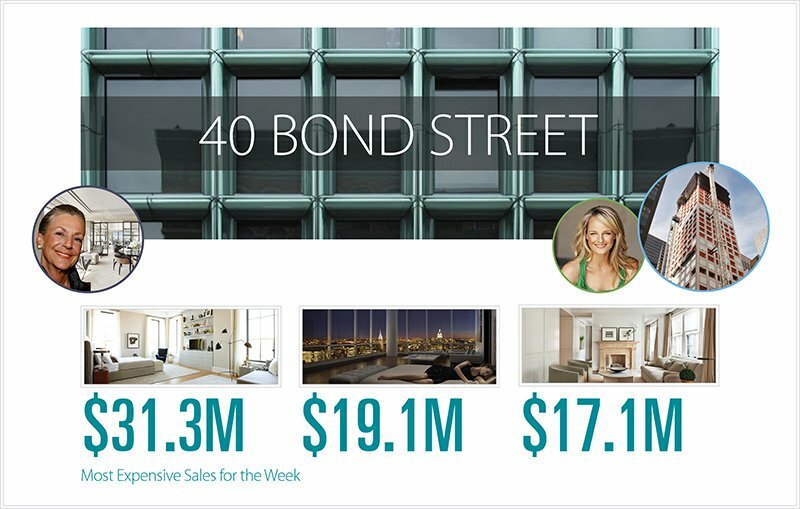 For market trends, top residential sales, and the latest starchitecture news, we turn to CityRealty‘s Weekly Market Snapshot for the scoop.